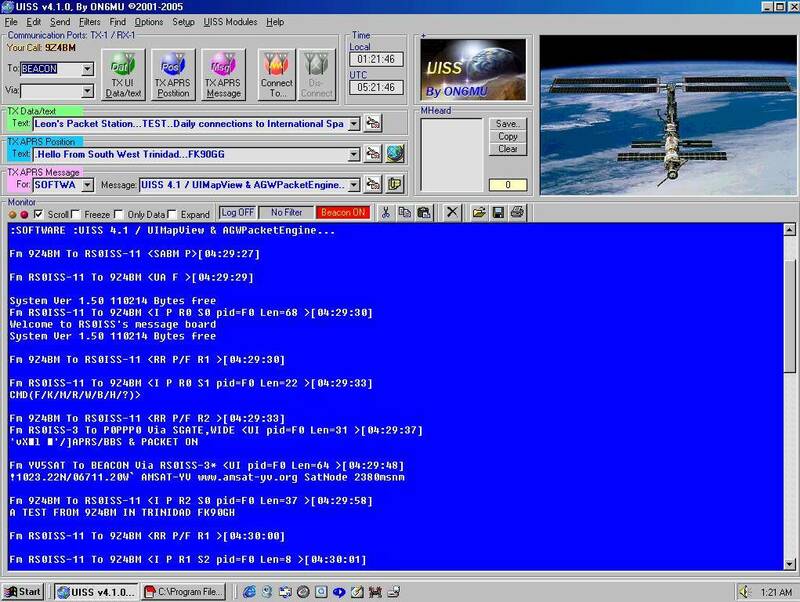 It is always nice and sometimes challenging to get into something new in Ham radio...Packet Radio is a new for me and I even went further to go into APRS as well...I am a person who likes the challenge in anything so I went one inch more and I am also doing packet via the International Space Station (ISS)...You can see my first contact to the ISS and the signals I received. I am running UISS as my packet program with AGWPE.This AGWPE is a program that allows you to use your soundcard as a TNC...so I didn't have to spend money on a TNC (neat huh ??).... Please click on the pictures to goto the relevant websites for further info and/or to download the software.. This is what the screen for AGWPE looks like......you can select the port , also this software uses the soundcard in your computer to work as a TNC or you can select the TNC that you have and still use your TNC......Using this AGWPE and soundcard is just a fast cheaper way of getting on packet......As seen from above I combined packet and my satellite station.... Please click on photos to goto websites for software or info. In addition to AGWPE, I am also running UIview32 for APRS (Automatic Position Reporting System). 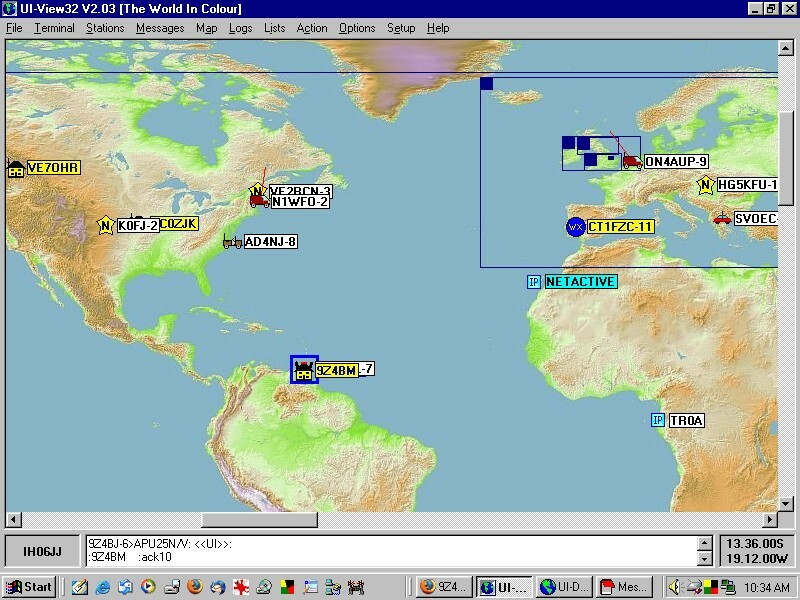 My packet station consits of an Icom 229 /Kantronics Kam+ /Software-AGWPE and UIview32..Below is a screenshot of the world map in UIview32 on my computer, everything on my packet station is via RF (144.390 mhz).There is an internet gateway setup in Trinidad by 9Z4FZ-Julien for APRS users here.All messages are gated to and from the internet via the IGate, I have been able to send text messages to stations all over the world with this system. To find out more about AGWPE and UIview32...Click on this link. Here is a nice write up on configuring UIview32. 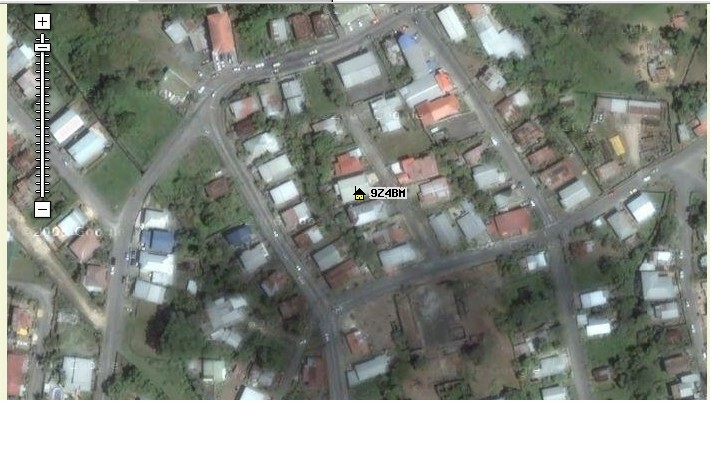 ( http://www.ui-view.org/findu.htm )..It shows my QTH in Trinidad..The house icon is a bit to the edge of my actual house (to bad it could not zoom more to show the antennas). 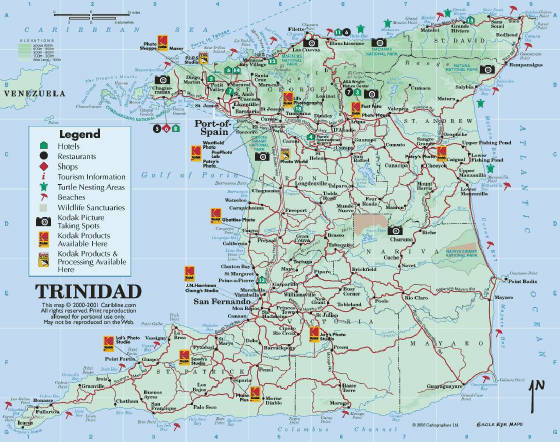 The website uses the google maps.. 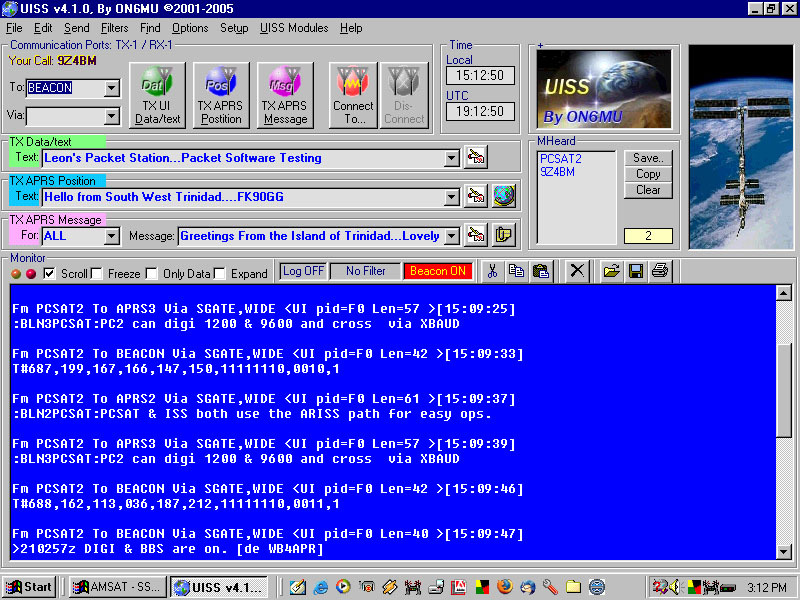 This screenshot is an Addon software to UIview32 called UIDXBridge....UIDXBridge is running on another computer(with all the APRS stuff) connected to the internet (24/7). 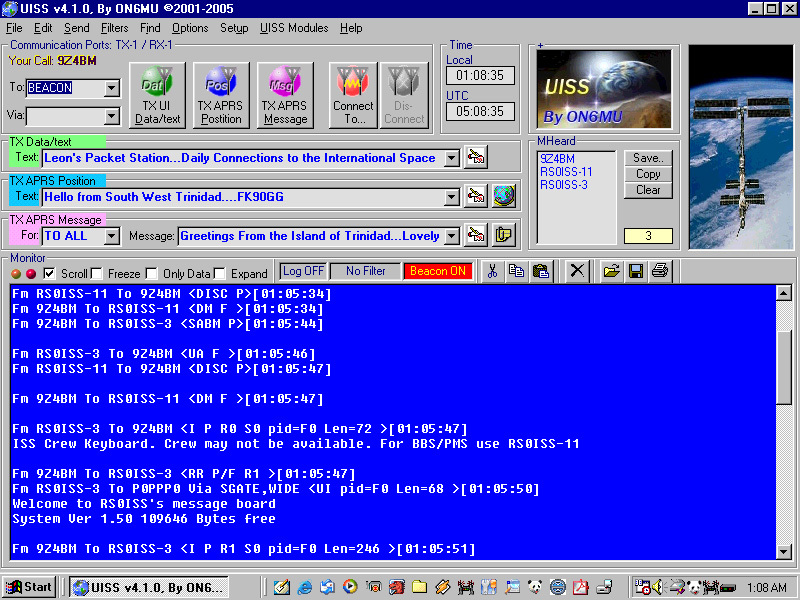 The software is setup to connect to a host machine (via internet) to receive info from the Dx Cluster..The info (DX spots) is transmitted via a 2meter radio on the packet frequency and received by me (or anyone else) on my computer via my 2meter packet radio setup. Simply put--I am getting my DX spot via RF, I no longer got to log on the net for this. I am dedicating a HF radio & a computer to just doing Digital modes....Like I said my aim is to be running on most or all HF bands ..as well as most of the different modes..
Click on the photo below to go to W5BBR page on building a simple keying interface for your computer to radio....This is very similar to the one I built for my FT-847....This simple circuit will key your radio , send audio from the computer as well as send audio from the radio to the computer so the relevant software will read the digital info......Works for all different digital modes. Here is the Homebrewed circuit for the FT-847 that I use..